The next time your daughter tells you she is bored, show her this video. And then try to replicate this adorable little girl’s moves. Using regular items from around the house, six-year-old Riley Dashwood pulls off the master of all trick shots. Come and see how it’s done (and how you can try her moves with your own hot shot tot). 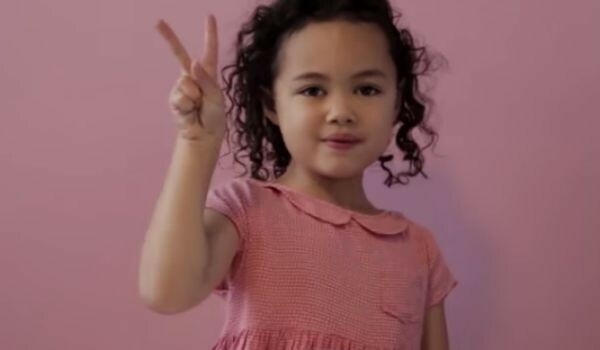 There are a number of tricky videos online showcasing the many talents of little ones, but what makes this one so special is an adorable curly-haired little girl named Riley. Riley has that certain spark about her…and she’s got the moves, as demonstrated in her video The Hug Life Chose Me, where she successfully nails every one of her tricky shots. Whether it’s flipping a DVD into a DVD player, flipping a piece of bread into a toaster or flipping a spoon into a cup, she does so by tossing the item over her shoulder and smiling a cheeky grin at the camera when she nails it. However, as simple and sweet as Riley makes it look, Riley’s dad, Rhett Dashwood admits the video, which has racked over one million views in less than three weeks, took days to shoot. And there were plenty of misses along the way! They’ve even created an equally entertaining video featuring all the adorable reactions of the cheeky little girl as well as her multiple misses. Keep the trickster shots coming, Riley! And keep smiling!